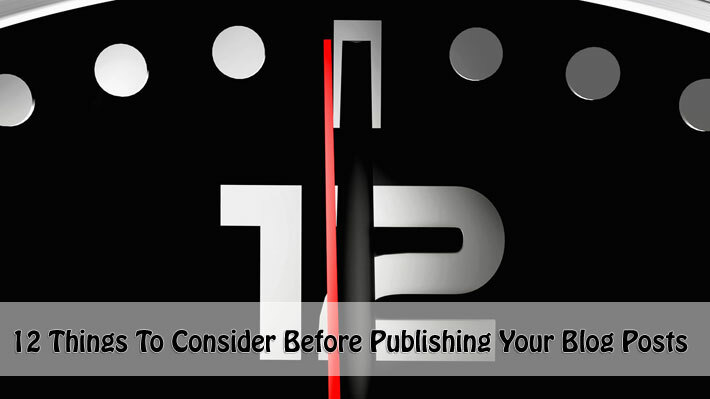 Are you among them who think twice before hitting the publish button? Then you belong to the wiser group. You should think twice before publishing anything online. Experienced marketers have one thing in common and it is the fact that they know the value of every single word and phrase which they use. Sometimes one word is all that is required for changing the image of a brand. So, you can easily see that tweets, newsletters, blog posts, webinar, etc. can be used as a medium for strengthening the image or message of your brand. Hence you should be careful about anything that is published in concern to the company name. In this post we discuss 12 things you should consider before publishing your blog posts. Generating an apt idea is the keyword and one amongst the most challenging facet as far as content creation is taken into account. You should always keep a running list of the content ideas which are branded. By branded it is meant that the ideas which have been already approved by the marketing team of our company. When blog posts are written, the writers have a choice of either formatting their own ideas or using one from the running list. This might sound too much for the beginning, right? But you must remember that if your idea is in the right path right at the start then you can save your idea from being shelved right in the beginning. The tone that you are using is unavoidable. You might have not noticed it before but whatever you say and in what way you convey the content is a mirror of your attitude. Hence you should pay heed to your writing style no matter what. You tone of writing plays an important role in your content as well as it conveys the attitude that you have towards you audience. You might be well versed with the importance of using the same kind of design aesthetics in marketing purposes; just the same way keeping a consistent tone of writing is also important. If you have a consistent tone in your writing, it represents a picture of trustworthiness, authenticity and familiarity. The audience will know what to expect from your blog time and again…this makes them feel at home. But it is easier said than done. Adopting a certain style of writing and keeping it consistent throughout your blog and maintaining the same with time is quite a chore. Revising and editing are not the same. Revising is a process in which the writer makes a review of his words, paragraphs and sentence structure so as to make sure that what he has written is accurate, clear and successful in portraying the brand. On the other hand, editing is review and correction of punctuation, grammar and spelling. It is a naked truth that you have to be picture perfect with your grammar or you will have to face troll comments. When you are taking branding into picture, revising is very important as it moulds the content in the exact way as the audience wants. When you are revising, keep the following points in mind. Are you careful enough when you are considering words and the way in which you should use them or the way in which these will be perceived by the audience? Are you making sure that the sentence structures of your content make the message clear to your audience? You should not leave any scope for people to imagine something which you do not want to convey. You should be as direct and as deliberate as you can. When you are writing, you do not have any help of using body language as well as inflection which are required for conveying your message. In the face of it, you should choose your words with utmost care. Your words should be chosen with care because if you do not do that, your audience are most likely to take your writing to be out of context. If you are using one word to many then your message will suffer chances of being buried. Alternatively, if you are using few words, your message will be at a risk of being vague. Hence, you must make it a point to use as concise language as possible. This will help in getting you point across to the audience. After you have mastered the art of making your blog posts alluring, you must understand that this is only half the battle won. Spicing your post in the right way is required even after you have written your blog posts in the most attractive manner. You must understand the things that should be taken into consideration before your blog post is ready for publishing. The whole idea is to make your blog post stand out among the rest of the blog posts. If you follow the points mentioned below, your blog posts will get the maximum benefit. A scannable content is usually preferred by readers as it consists of short paragraphs, headlines, sub headings and bullets…all used in the way they ought to be. A properly organised content is easy to read as well as understand. It also speaks volumes about professionalism. You should work on improving your writing skills so that your article is scannable. The first thing that attracts the readers is the catchy headline. If your headline is not catchy enough, you will find that your readers will not be attracted to read further. Headlines are the first things that draw the attention of the readers. The length should be just right. That is, neither too short nor too long. You can take an average of number of words to be not more than 7 to 8 words but not less than 4. The number of characters used should not exceed 69 as Google displays just 69 characters in SERP. Phrases like “How To”, “Top 10”, “Top Most”, etc. catch the attention of reader and hence these should be used often. One more thing, your headline should not be a cocktail of fonts, colours and font sizes, etc. this will throw light on unprofessional aspect of your blogging. Ranking higher in search engines involves linking to older posts. If you are linking an older post to a newer one, if they are relevant to each other then you are following the right strategy. The only care you should take is not to over link. It is not how many outbound links that matters but the quality of them that does the trick. You should always focus on the outbound links that are relevant to your posts. You should refrain from irrelevant domains, inactive websites or fake information websites, etc. You will see your ranking get better with this strategy. After everything, the only step left is to recheck your posts in proof reading. This will help you get rid of silly mistakes that you might have overlooked while typing. Wait…there is more. And this time from the Blogging Gurus. The team over at Copyblogger and their lead designer Rafal Tomal, have put together this infographic to guide you through the process. Before you write that next blog post, make sure you’re checking off all the items of this list. Oh yes, click here to to get the one-page PDF of these rules, good for printing and hanging near your workspace when you need to see it most. What other thing you consider while publishing your blog post? Share your experiences below. Thank you for the ideas and the tips. I do think twice before posting on my blog. Making sure I have a catchy title, proper keywords and proofreading are on top of my list! Great share. Awesome Lynne! You’re really doing great with your blog posts.